Since its inception in 2006, The Future Sound of Egypt brand has been at the forefront of the Trance music industry and has had great influence on the growth of the scene as a whole. Year by year, the brand has grown stronger and stronger and is currently one of the main Trance Brands within the genre. Aly & Fila have stayed true to their roots from the beginning and their immense success over the past 9 years is proof that Trance is as alive as ever. The radio show has featured some of the best work from countless artists over the years and continues to do so each and every week. When the radio show was first introduced, it was only broadcasted on DI.FM once per week, and is now featured on 50+ radio stations worldwide. Since the radio show celebrations went international in 2013, thousands upon thousands of clubbers flooded dance floors around the world with growing numbers each and every year. The Live broadcasts have given Trance fans from all corners of the globe the opportunity to connect with one another in an incredibly special way. 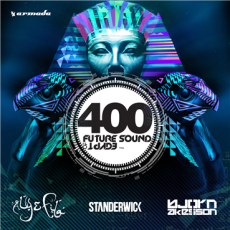 This ‘FSOE 400 compilation’ is the culmination of the past 9 years of hard work and dedication from Aly & Fila. From everyone at Future Sound of Egypt and Aly & Fila – we’d like to thank all of for the continuous support over the years, which has helped the brand become what it is today.